The marketing process is managed by me as Head of Marketing and I am assisted by Flo who is Marketing and Publishing Coordinator. Together, we make sure that we publicise each book to booksellers, retailers and individuals as well as across our social media channels. We also produce print catalogues and regular email newsletters to promote our books and ensure we inform relevant organisations and groups. We receive all kinds of queries throughout the marketing process so I’ve attempted to answer some of the most common questions here. When will you start marketing my book? As soon as a book goes into production we begin the marketing process. This will be approximately 6 months before publication. We create an individual marketing plan for each title and incorporate both the commissioning editor and the author’s suggestions. You can read more about this process in Flo’s blog post. Can I buy copies of my book at a discount? Yes, as an author you are entitled to a 50% discount on all our titles, including your own book. We will also provide you with a discount flyer for you to send to all your friends and colleagues and take to any talks you are giving or conferences you’re attending. The price of my book is incorrect on Amazon / My book isn’t available on Amazon. Can you fix this? We can’t make changes directly to Amazon’s site but if there are any errors such as prices, publication date, title etc we can request for these to be updated as soon as possible. Unfortunately, we’re unable to prompt Amazon to place an order so sometimes your book may be marked as unavailable due to a delay in them ordering stock. Will my book be on sale in my local Waterstones? It’s possible that Waterstones will stock your book if it’s a university branch and the book is a course book at your institution. Otherwise it’s unlikely that your book will be available as they stock very few high level academic titles in their high street stores. However, the main sales of our titles come from other sources so please don’t be concerned if your local bookshop isn’t stocking your book. Will you be marketing my book on social media? Yes, definitely! We market all our books through our various social media channels. Campaigns are always more successful when the author is involved so we send our authors a detailed guide to marketing on social media at the start of the marketing process. Can I post about my book on Facebook? Yes please do! Although we market all our books through our own channels, it’s always far more effective for authors to utilise their own personal contacts to sell their book. Can you send a review copy of my book to X journal? We are happy to send review copies of your book to relevant journals and will be asking for suggestions at the start of the marketing process. Please be aware that some journals don’t have a book review section and therefore will be unable to review the book. Do I have to fill in an author questionnaire? Yes you do, and your commissioning editor will send it to you at the appropriate time. The information you provide on your author questionnaire is vital for helping us to understand how best to market your book and to reach the appropriate audience. It is also the best way of sharing any of your own existing contacts and any other ideas you have for marketing your book. Will you be organising a book launch for my book? We’re not able to organise book launches for every book but if you are organising an event, please let us know so that we can arrange for copies to be sent in good time, and if it’s local or we happen to be in the area, we may even be able to attend. 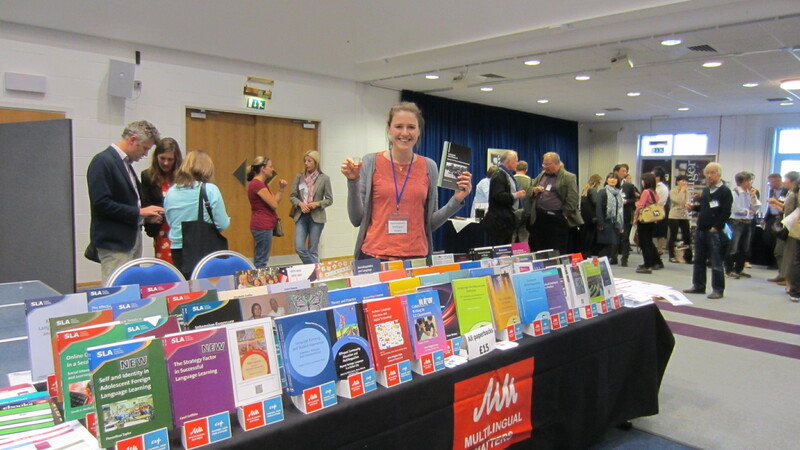 Equally, if there is a conference where a book event is appropriate we would be happy to support you with marketing materials. Will my book be featured in mainstream media? Our books do occasionally get picked up in mainstream media but these are exceptions, not the norm. However, if your book relates to a topical or controversial issue that is currently being covered in the media then it’s possible that it can be featured. Any media contacts you have or ideas for publications for us to approach are very helpful. Can I have a free copy of my book for my mum? Yes of course! On the author questionnaire you can list people who you would like to receive a copy of your book. We usually suggest that you list influential people in your field who will be interested in your work and may help promote it, but of course you can list your mum as one of your recipients. Will all the contributors to my book receive a free copy? What the contributors will receive is stated in the contributor agreements which are signed early in the editorial process. If you have any queries about this, please contact your commissioning editor. Will my book be on display at X conference? If you have listed the conference on your author questionnaire we will do our best to get some publicity there. Unfortunately we don’t have an unlimited budget and the costs of some conferences are so prohibitive that we’re unable to attend all those that we would like to. Why isn’t my book going to be published in paperback? 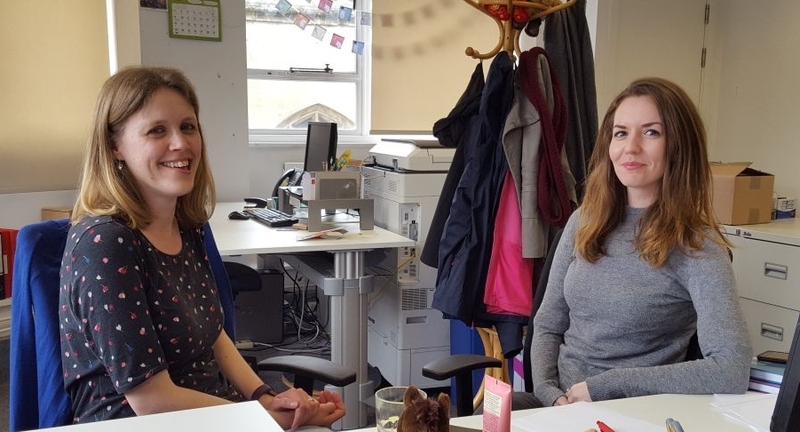 The decision of whether to publish your book in paperback and hardback or hardback only is made by the commissioning editor and the rest of the team. Your commissioning editor is your best contact for this question. Will my book be listed in your catalogue? Yes all our recent books will be included in our main catalogue which is printed each year in September. Go to our website to join our mailing list to ensure you receive a copy. If you have any queries about social media or review copies, please contact Flo at flo@multilingual-matters.com. For all other marketing queries please contact me at elinor@multilingual-matters.com. 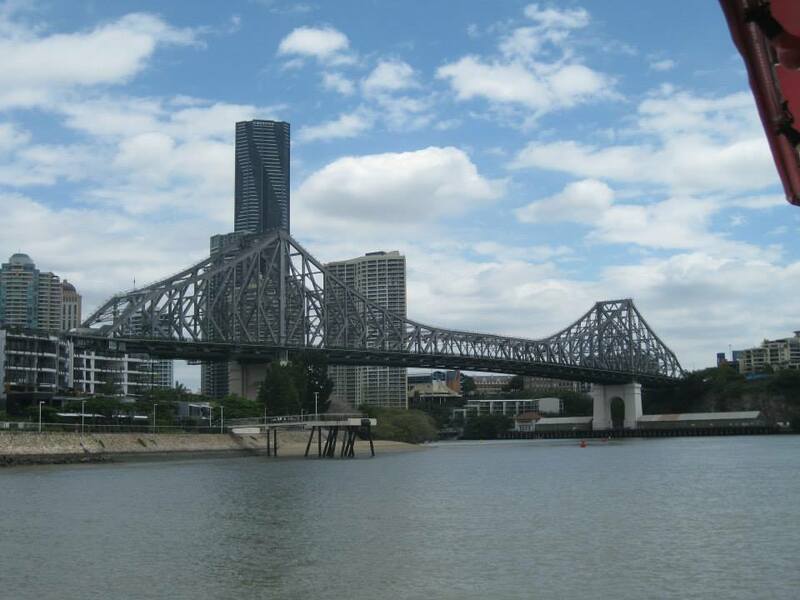 It was the University of Queensland’s turn to host CAUTHE this year and the conference was held in the Sofitel in Brisbane – with a lovely view for us exhibitors of Anzac Square. 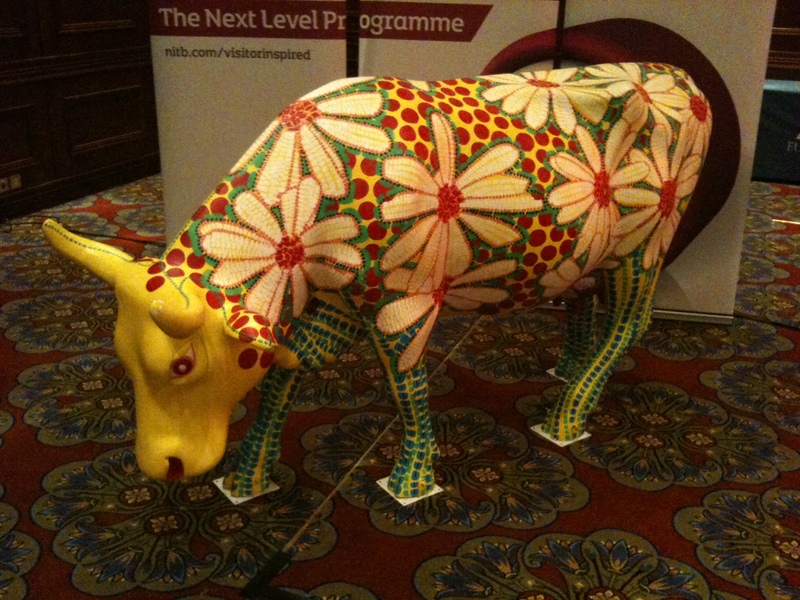 Noel Scott and his team of volunteers did a great job of organising especially as there were more delegates this year! As usual, it was a successful trip for Channel View and a great chance to catch up with a lot of our authors and meet new people. 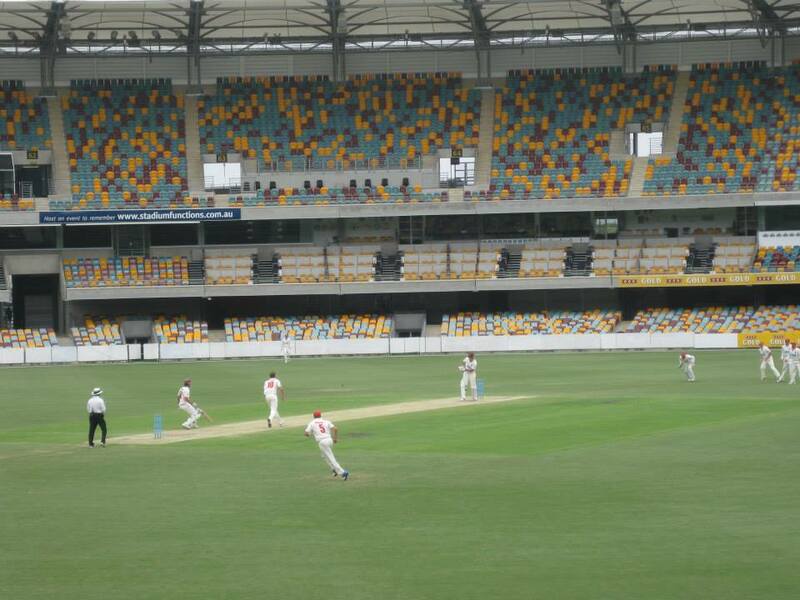 There were some thought-provoking keynotes from Stefan Gössling and Ulrike Gretzel and the Great Debate was won by the Aussies this year – in keeping with general sporting results! 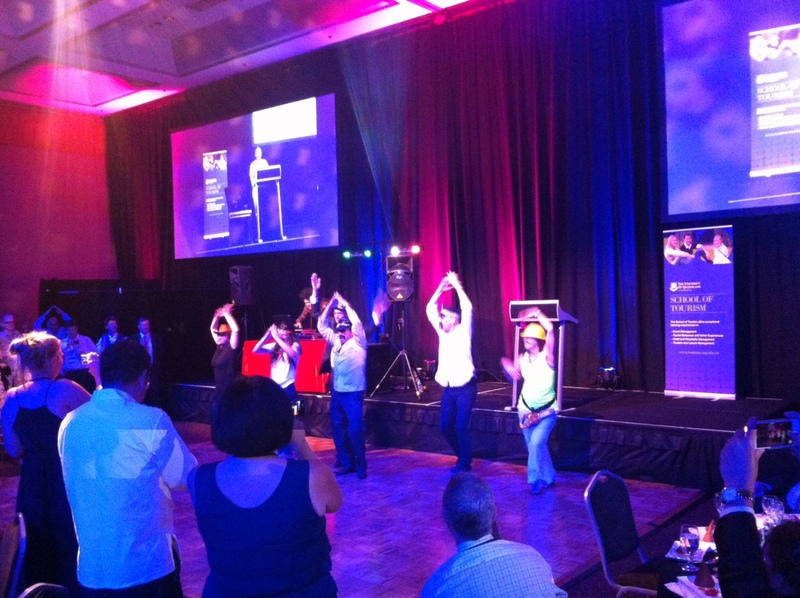 The conference finished with a great evening of dinner and dancing – made even better by an awesome YMCA performance from the UQ staff! We’re looking forward to next year’s CAUTHE which will be hosted by Southern Cross University. 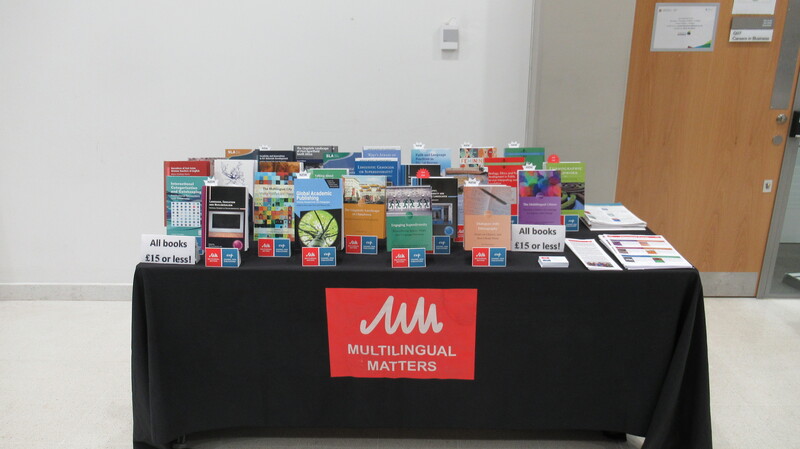 This year Heriot-Watt University in Edinburgh was host to the annual British Association of Applied Linguistics (BAAL) Conference so I headed north to run our stand and enjoy a few days in Scotland. We’ve had a busy summer and published quite a number of books in the past few months so this was reflected at the conference: delegates streamed to our stand to browse the new publications which were making their first conference appearance – among the popular books were Blommaert’s Ethnography, Superdiversity and Linguistic Landscapes and Ramanathan’s Language Policies and (Dis)Citizenship. The welcome reception on the first evening was doubly exciting. Not only was there a string quartet and whisky tasting for the delegates to enjoy, but also the announcement of the BAAL Book Prize 2013. We were delighted for our author Alastair Pennycook, as his book Language and Mobility is the joint winner of this year’s award. Sadly Alastair wasn’t present to celebrate his achievement, but I was delighted to accept the cheque and toast his success with some raspberry gin in his place! 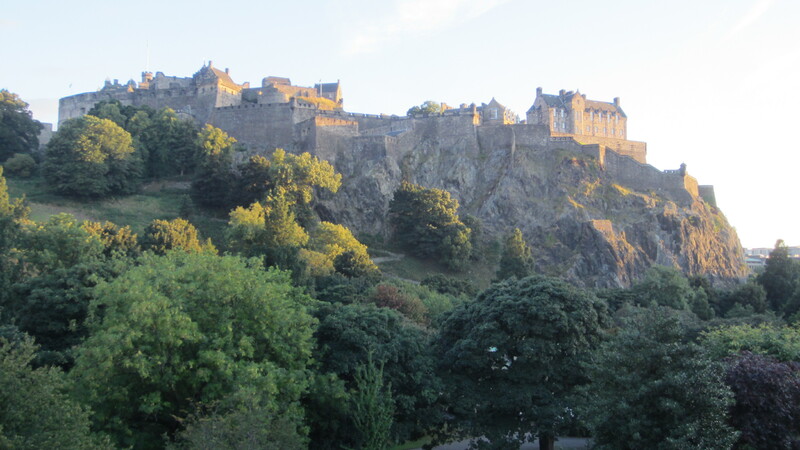 Apart from the conference I had fun exploring Edinburgh in the evenings. The centre and castle were beautiful in the end of summer dusky light and I made a special trip to the Elephant Café where JK Rowling spent a lot of time when she was writing the first Harry Potter book. To see the full selection of my photos from the trip please visit our Facebook page here. 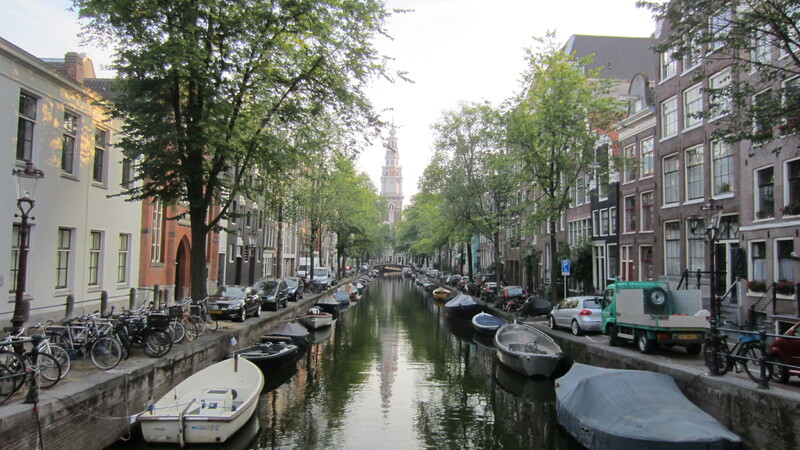 While the EUROSLA conference has been held in the Netherlands before (Nijmegen, 1996) this was the first time in the conference’s 23 year history that Amsterdam has been the host city. It was a popular destination choice as the conference was its biggest ever, with 350 delegates coming from 35 countries to make it a really vibrant few days. 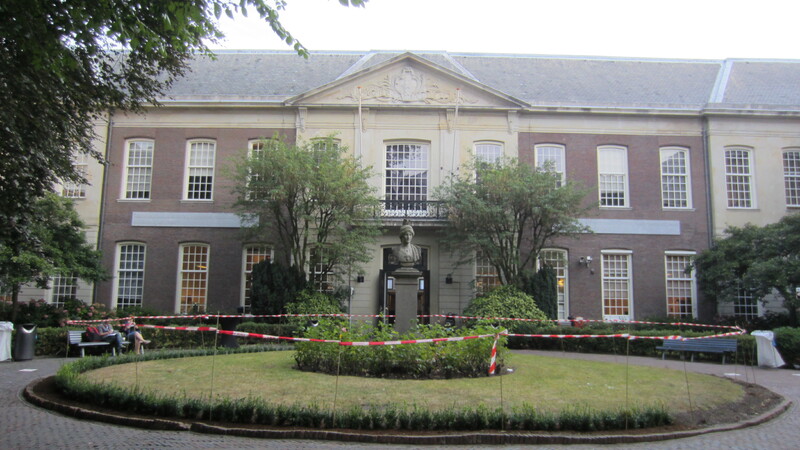 The main sessions and plenaries were in the Oudemanhuispoort building at the University of Amsterdam, which was situated right in the centre of the city with a beautiful quadrant, the canals and second-hand book stalls nearby. 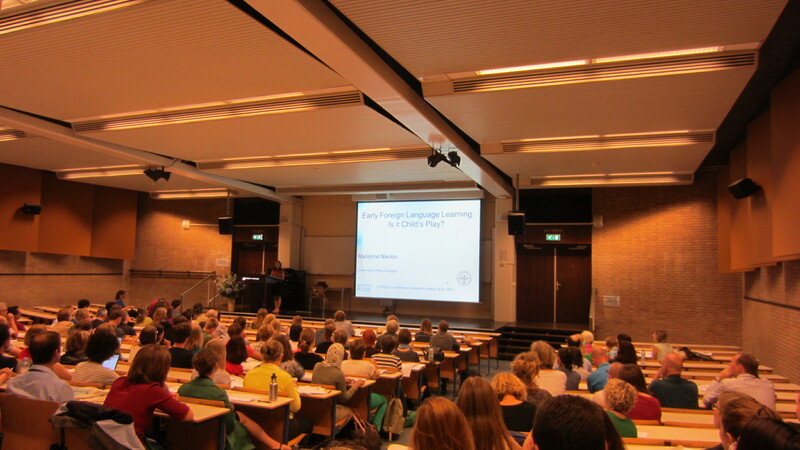 We also had the opportunity to go to the University of Amsterdam’s impressive Auditorium for Alison Mackey’s opening plenary “Methodology in SLA Research” and to the recently reopened Amsterdam Museum for the welcome reception. 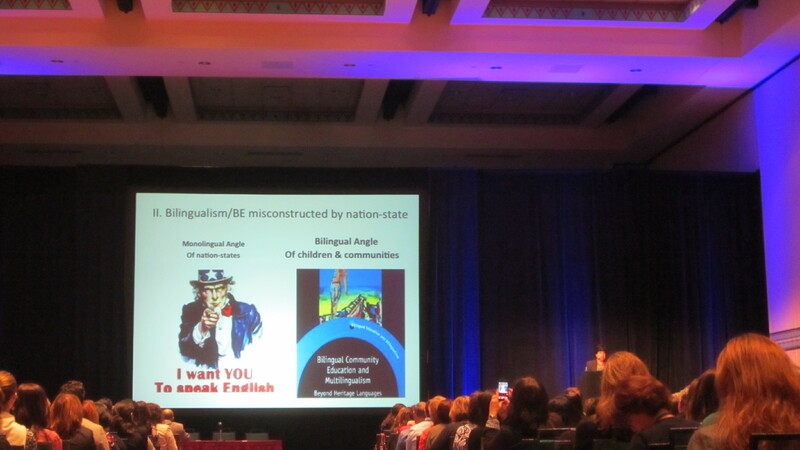 Another plenary highlight was that of our author Marianne Nikolov who spoke about early foreign language learning. 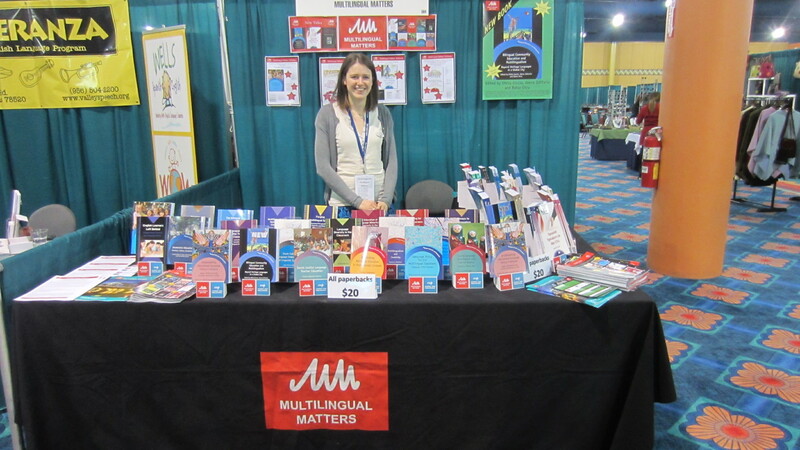 I was pleased to have well-stocked my stand with copies of her book Early Learning of Modern Foreign Languages as there was much interest in it thereafter. That evening we had the conference dinner in the unusual Chinese “Sea Palace” and were treated to many different dishes for us to sample – none of them “typically Dutch” but as it was explained to us, it’s hard to pinpoint what exactly is typically Dutch! Kees and Seline from John Benjamins’ kindly took Nina Spada and me out for dinner on the final night. The menu was in contrast to the night before and I have since enjoyed using my newly acquired Dutch word “gezellig” to describe our evening together! You can see more of my photos from the trip on our facebook page here. Ellie and I both attended CAUTHE this year which was very exciting! 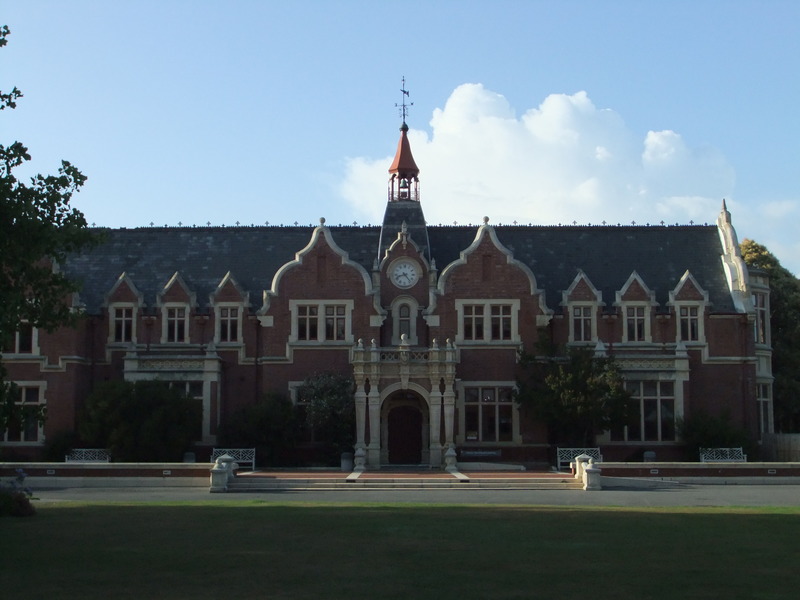 The conference moved to New Zealand for this year and was held at Lincoln University in Christchurch. 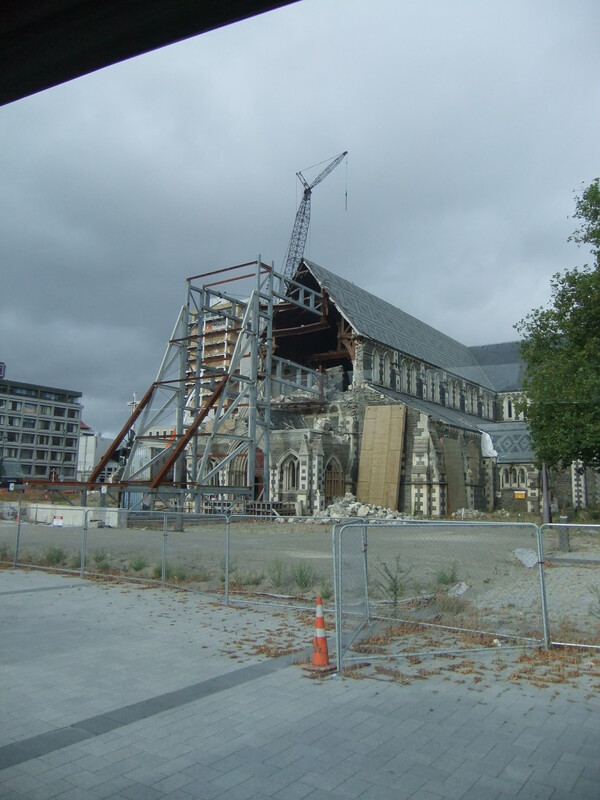 CAUTHE was the largest conference (in terms of delegates) to be held in Christchurch since the earthquake in 2011. The opening keynote of the conference was from Tim Hunter, Chief Executive of Christchurch and Canterbury Tourism, who gave a fascinating account of Christchurch’s ongoing recovery and the ambitious future plans for the city. We also had the opportunity to tour ‘the red zone’ in the city centre (where vehicles and pedestrians are currently prohibited) to see the effects of the earthquake up-close. 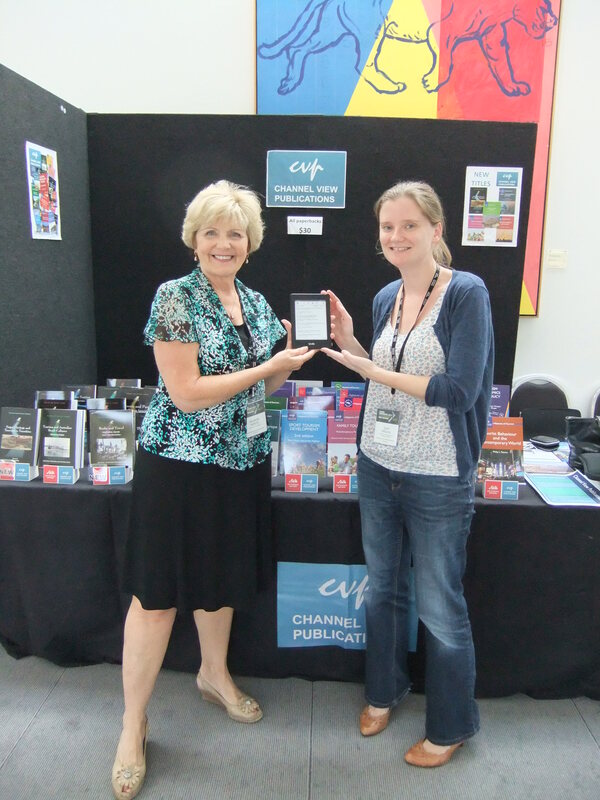 At this year’s conference, we gave away a Kindle, preloaded with 85 of our books. Elizabeth Roberts, from Southern Cross University, was the lucky recipient after Ellie drew her business card out! The high standard of papers of past CAUTHEs was continued this year, and the Great Debate (this year, Tourism on the Edge: Slow & Local vs Fast & Global) was again a feature of the conference – the Australasians (Slow & Local) with a resounding victory despite the Rest of the World’s best efforts! We also had a chance to sample a variety of local Canterbury wines which many of us enjoyed! The conference was brought to a very fun end at Riccarton House, a local heritage site, with more wine and lots of dancing. CAUTHE returns to Australia next year and we’ll be looking forward to seeing all the usual suspects and hopefully meeting some new faces in Brisbane! 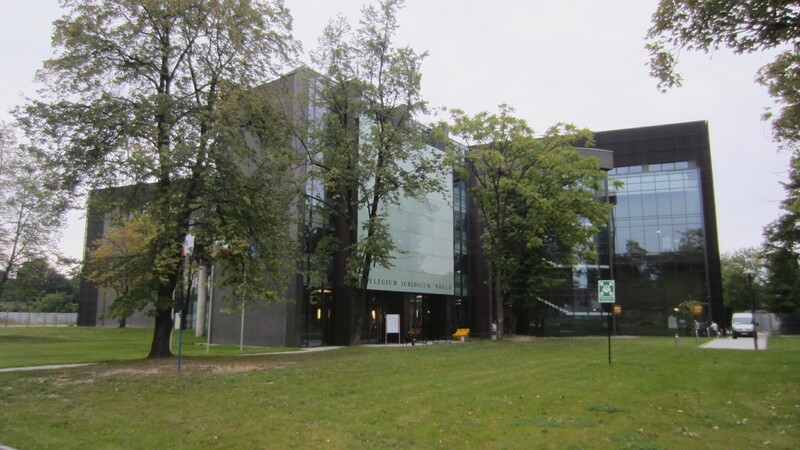 This year’s EUROSLA conference was held at the Adam Mickiewicz University, Poznań. The venue was the stunning Collegium Iuridicum Novum building, a brand new facility for the university’s Faculty of Law and Administration. 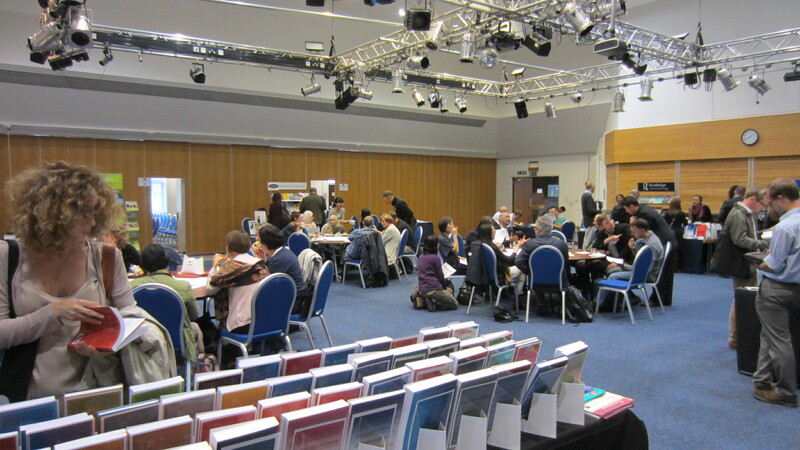 The conference was its usual bustling self with many people commenting on the range of interesting paper themes and the trouble in finding the time (and sometimes energy!) to get to them all. The welcome reception consisted of a concert and drinks reception in a hall in one of the older parts of the university. 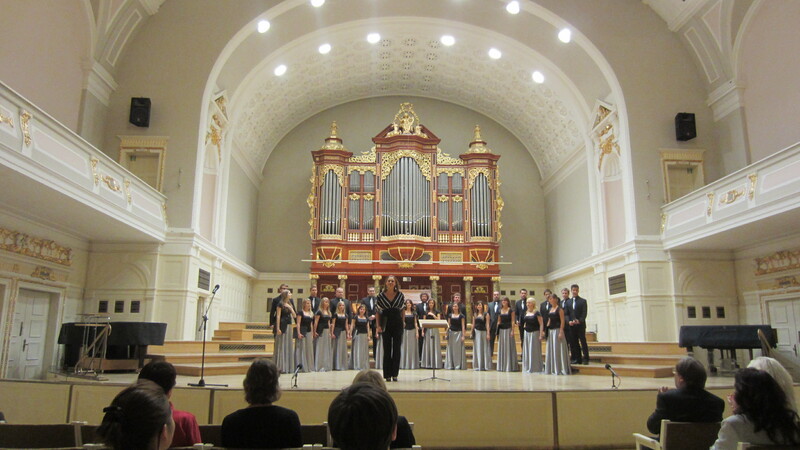 The performance was given by the university’s academic choir, who have toured all over the world and who had returned to Poznań before the start of term especially to sing for us. It is some time since I have been to a choral concert and I was surprised at how much I enjoyed it. The choir sung a range of pieces including traditional Polish songs and their own takes on popular music. My favourites were their version of “Chili con Carne”, complete with vocal percussion, and a choral rendition of the “William Tell Overture”, which included the choir trotting across the stage while singing! After the concert I thoroughly enjoyed chatting, sampling the mysterious foods and even drinking the local vodka! The choir’s motto “bringing joy through singing” certainly rang true that night. As mentioned above, a personal highlight of my time in Poland was certainly trying a range of foods I’d never eaten, or even heard of before. I gradually worked my way through the different types of pierogi (Polish dumpling), trying both savoury and sweet ones; the best one I ate was a chocolate and peanut one, yum! 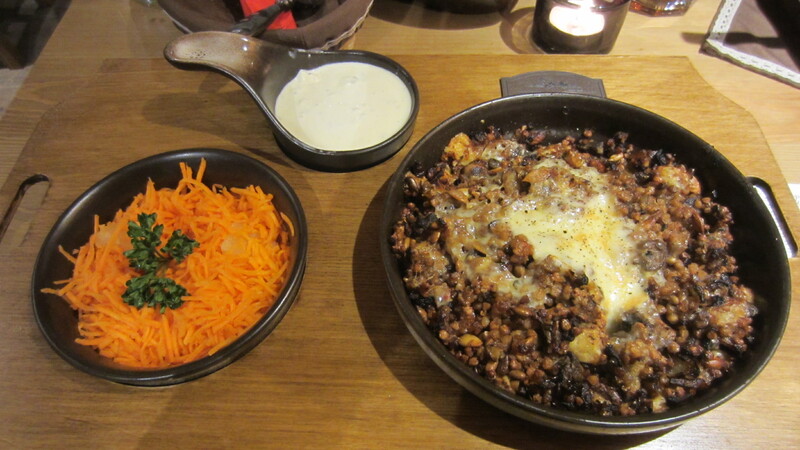 I also discovered kasha, a savoury dish made from buckwheat groats and served with a delicious creamy, cheesy sauce and enjoyed some bigos, a stew which I had memory of some Polish friends making when I lived in Germany. It was as good as my memory told me it would be! Having not been to Poland before I thought I’d take the opportunity to take some days holiday, so I not only visited Poznań but went on to spend the weekend in Wrocław and a few days in Kraków. Tommi and I have just returned from the Sociolinguistics Symposium 19 in Berlin. 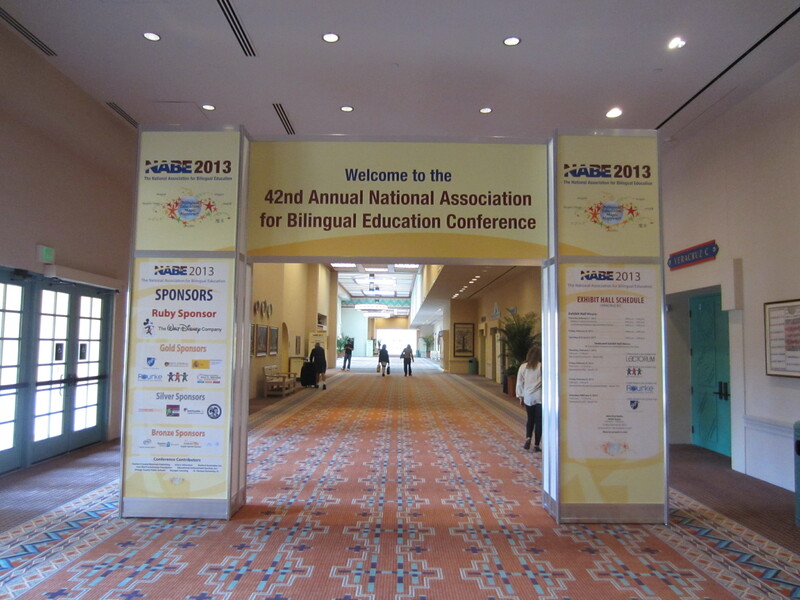 It was a very successful conference and has grown to over 1000 delegates this year. 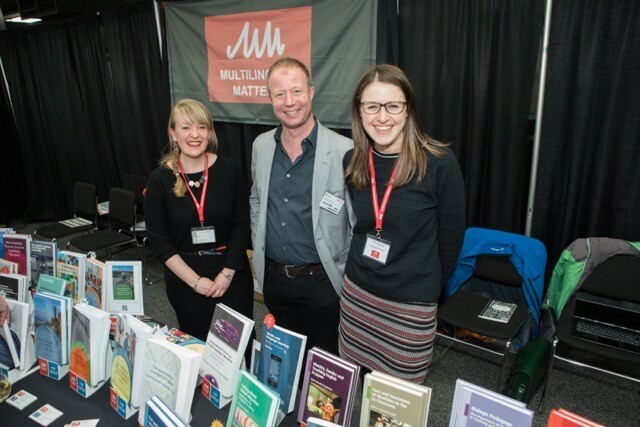 However, despite being larger than ever before it is still a very friendly conference with a lot of familiar faces and it’s always nice to meet up with our authors and editors. 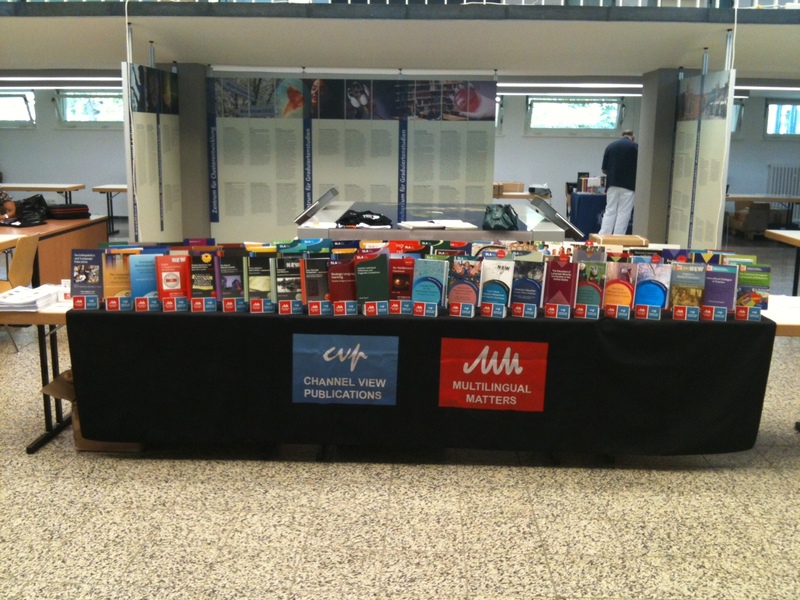 This year we had so many titles on display that we could barely fit them all in despite having 3 tables! The organisers from the Freie Universität Berlin were incredibly helpful and friendly and made it a very enjoyable conference. We took a lot of pleasure in sampling the local cuisine in Berlin and we particularly enjoyed tucking into the delicious German cakes in the coffee breaks at the conference. 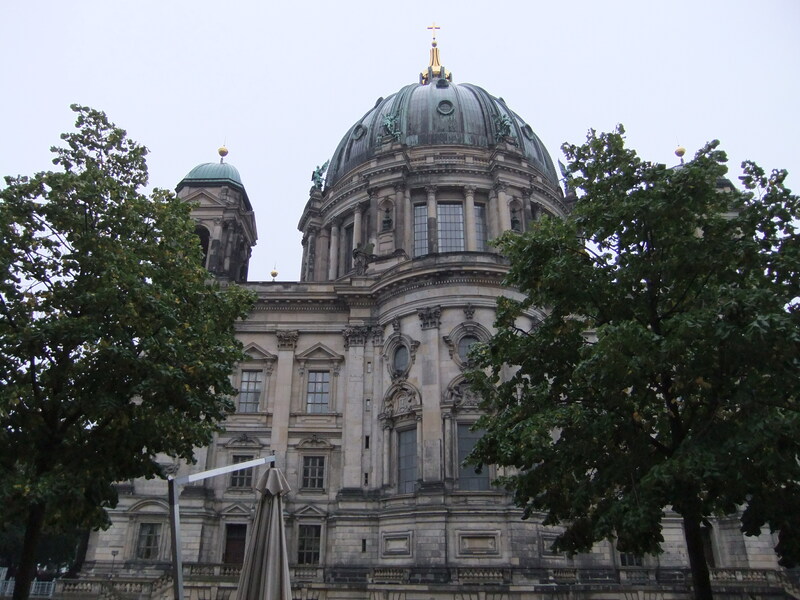 We stayed at the Radisson Blu Hotel in Berlin which is situated right on the river Spree and we ate our breakfast every morning with a beautiful view of the Berliner Dom across the river. The other main attraction of our hotel was the incredible AquaDom which is the world’s largest cylindrical aquarium and contains one million litres of saltwater. 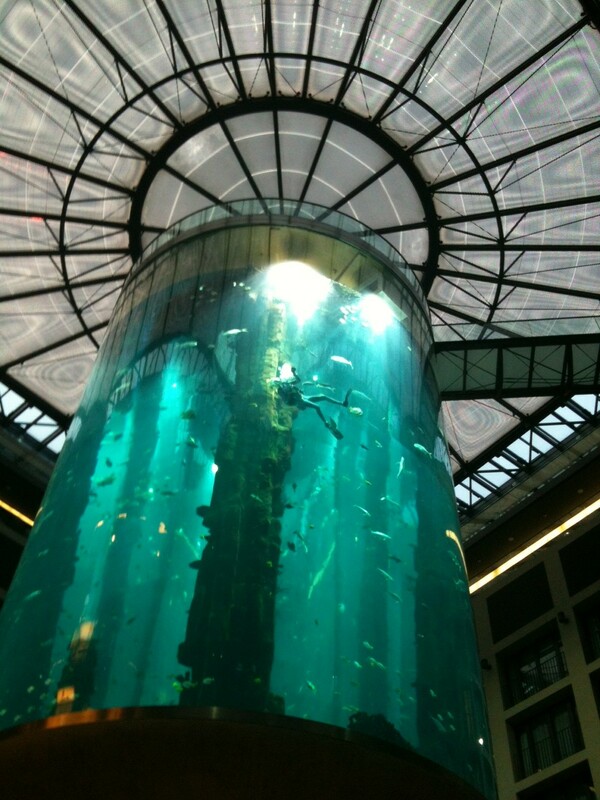 The aquarium is 25 metres tall and rises up from the foyer of the hotel to the sixth floor. We spent a lot of time gazing at the fish and watching people in scuba gear cleaning the inside of the aquarium! Tommi celebrated his birthday while we were in Berlin and after the conference had finished for the day we headed to the Tiergarten for food and drinks in a beer garden with our fellow publishers from Mouton DeGruyter and John Benjamins. Unfortunately as soon as we sat down with our pizza and beer it started to pour with rain so we had to run under cover to stay dry! However, we then headed to a cocktail bar to keep dry so it wasn’t a complete disaster! We were lucky to have the opportunity to have dinner with two of our authors while we were in Berlin too. On Thursday evening we went out for dinner with Nancy Hornberger and Terri McCarty. It is really nice to socialise with authors away from the conference when we are not distracted by selling books and can have a proper conversation. We went to a restaurant called Dressler on Unter den Linden and had a lovely evening sitting outside eating, drinking and chatting. In 2014 the Sociolinguistics Symposium will take place in Jyväskylä, Finland and we are already looking forward to it and planning our trip! 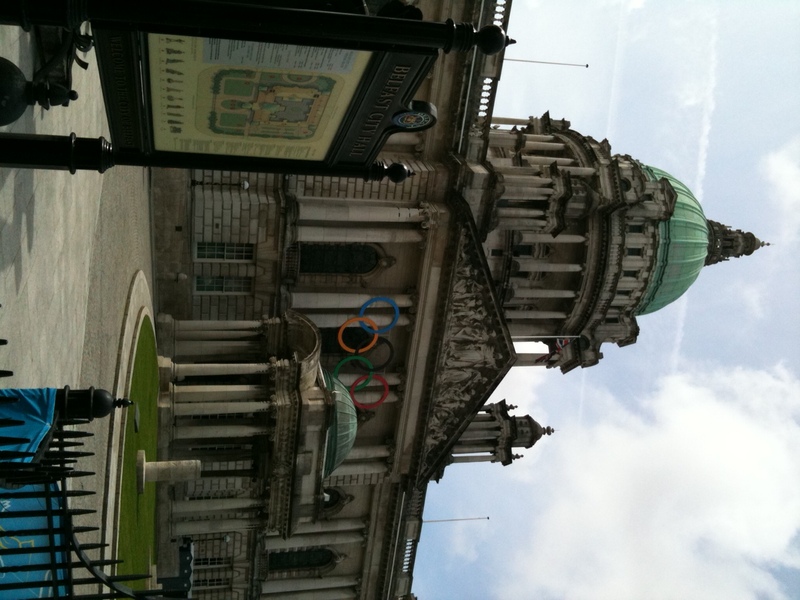 Last week I travelled to Belfast for the International Conference on Tourism and Events organised by the Ulster Business School. 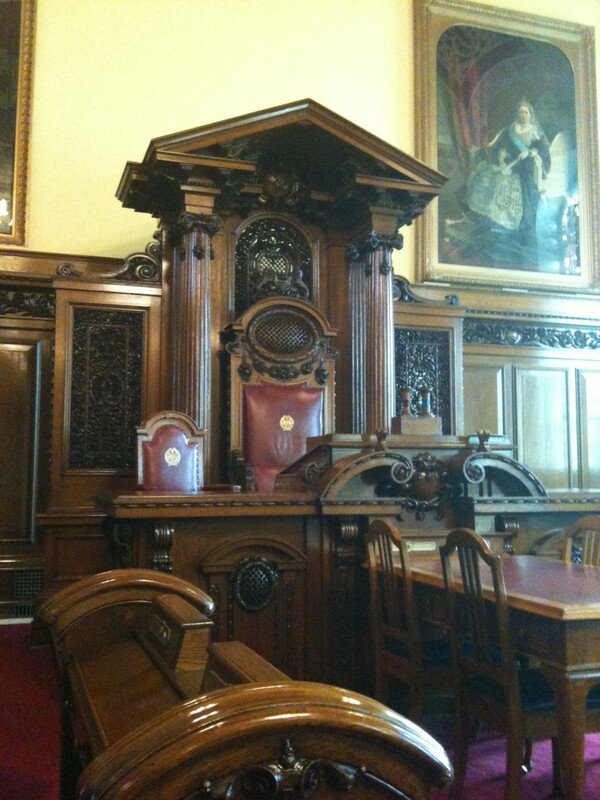 The conference was packed with thought-provoking keynote speeches and interesting papers. It took place in the Europa Hotel which was a very comfortable venue despite once having been known as the most-bombed hotel in Europe! Having never been to Northern Ireland before I didn’t know very much about Belfast but found people incredibly welcoming and keen to share their local knowledge. 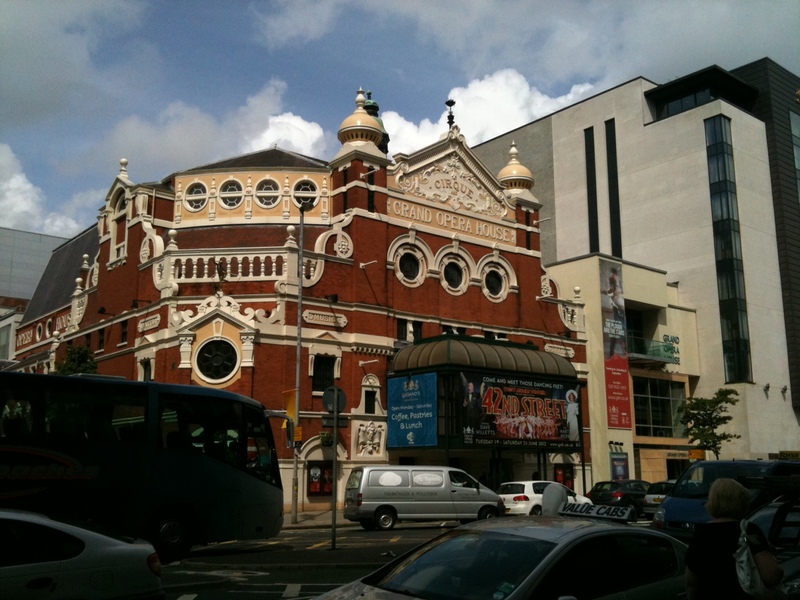 2012 is a big year for Northern Ireland as they’re hosting many international events and developing the city as an important tourist destination. One of the city’s newest tourist attractions is the brand new Titanic visitor centre which is a fascinating museum which explores Belfast’s role in the Titanic legacy. Definitely worth a visit if you’re in town! I met a lot of new people at the conference, many from Northern Ireland and the Republic of Ireland but also from much further afield. Conferences are always a great opportunity to meet new people and it’s always exciting to hear about exciting new research projects. As usual, the conference came to an end very quickly and I felt I hadn’t had enough time to experience Belfast fully but I hope to have the chance to head back in the future to explore the city properly.